The Giulietta is a name that has served Alfa Romeo well over its 100-year history. To see if that legacy would continue in its latest iteration, I spent the final few days of 2016 in the oil-sipping super-green 2017 Alfa Romeo Giulietta 1.6 JTDM-2 120. (Before you ask, the range-topping Quadrifoglio Verde wasn’t available). A cold post-Brexit Blighty, specifically my old stomping ground London, was where I spent time with the stylishly-formed playful little red Alfa. Despite what you may have read on VW-loving, German-obsessed outlets, the Giulietta is a gem of a car. Owners that I’ve spoken to and whose opinions I’ve read online absolutely love this car. 5 star ratings are commonplace and now I know why. For starters, just look at it. Nothing in this segment, the VW Golf, Volvo V40, Audi A3, BMW 1 Series, is as easy on the eye as the little Italian beauty. London is littered with hatchbacks, but only the Giulietta was designed in Milan darling. Glimpsed in their rear view, drivers will see a handsome Italian face inspired by the 8C Competizione. Attractive features include the sculpted hood, pouting vee-shaped grille forcing the license plate to the left and seductive headlights packing vertically-aligned LED DRLs. Turn to the side, and the five-door mimics a three-door thanks to rear door handles integrated into the window frame, while the 17-inch 5-hole design alloys are a must-have 450 GBP optional extra. The high beltline flows into the gorgeous taillights, in which the red LEDs form beautifully distinctive shapes, not unlike a pair of elongated teardrops turned on their side. An extra exhaust would have rounded off the rear perfectly (certain engines boast the twin setup), while pressing the Alfa badge is how one pops the trunk. When it comes to style then, in its class the Giulietta is without peer. Step inside and there’s a nicely appointed cabin with decent space for four. Features include a central 5-inch touchscreen with smartphone integration, paddle shifters behind the leather steering wheel of my TCT-equipped model and a decent smattering of soft touch materials among the hard plastics. In Super trim, the Giulietta also came with rear parking sensors, dual-zone climate control, a cooled glove box and automatic wipers and lights. Go further up the trim level, and the Veloce model will give you a potent 238-hp 1.75-liter gasoline engine, leather and Alcantara upholstery, bigger wheels and a sports suspension. The Giulietta is offered with a range of gas and diesel engines. Ours was a 1.6-liter turbodiesel sending 119 hp to the front wheels via a six-speed TCT gearbox. Even when loaded with two adults and two kids, the Alfa offered more than enough poke around town, while impressive economy meant a full tank was enough for over 400 miles of driving. All powerplants come with Alfa’s DNA switch, which alters the throttle response and steering feel depending on the mode: Dynamic, Natural and All-weather. This is a fun feature for a little hatch bordering on the gimmicky. In Dynamic the Giulietta does liven up a tad, showing its sportier side especially when using the paddle shifters for manual gear changes. It’s beautifully composed, holds the road as good as any hatch on the market, and the strong brakes provided plenty of confidence. When pottering around town, the gearbox offers smooth and slick automatic changes, and the suspension and wheels combine to absorb the bumps that beset British roads. Like other premium brand hatches on the market, think Mercedes A-Class and Audi A3, the Alfa Romeo Giulietta sacrifices practicality for style in certain areas. This is most notable inside, where rear passengers have limited headroom and legspace. But for a family of four with pint-sized kids this isn’t an issue. Up front, the cabin also feels slightly cramped, but this isn’t a car designed for long road trips and as a six-footer I had no issue spending a couple of hours crossing London in the little hatch. The boot space is equally compact but at 350 liters is more than the Ford Focus and about average for its class. The Alfa Romeo Giulietta then, has struck the important balances perfectly offering strong performance and excellent economy, a dynamic, compliant chassis with appreciative refinement, and a competitive price starting from $23,000 (the car we tested was just under $30,000) for what is a well-equipped, stylish, and sporty little car. Unfortunately, you'e going to have to leave the US if you want one. 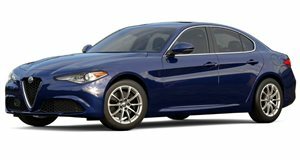 2017 Alfa Romeo Giulia First Look Review: Should Germany Start To Worry? Probably not, and here's why.